Christchurch is seeing a drop in the number of people living on the streets thanks to the work of the Housing First collective impact group down there, including Christchurch Methodist Mission, Comcare, Otautahi Community Housing Trust, Emerge Aotearoa, the Anglican City Mission and Te Whare Roimata. 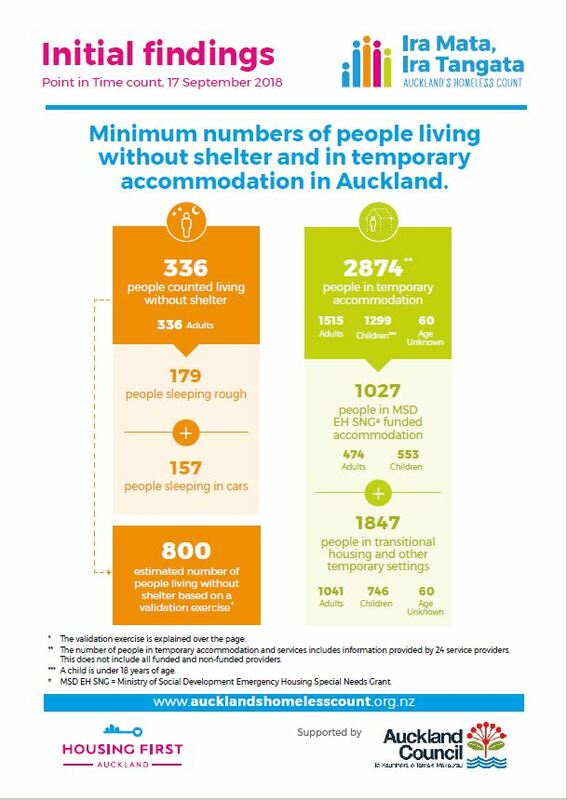 In other cities where Housing First is operating, Hamilton and Auckland, have also seen more people moving from homeless into stable housing situations. But the overall challenge to overcome homelessness is still huge. The recent homelessness count that was conducting in August 2018 in the middle of Auckland’s winter, showed that there are nearly 3,000 people homeless in the city, a similar level to that arrived at by the Otago University study using the 2013 census figures, which also came out at around 3,000. There is still immense pressure on low income families and other centres are feeling the pressure now as well. One key missing piece in the homelessness puzzle is the access to public housing through Housing NZ or community housing providers, as well as finding affordable private rentals. More public housing is beginning to become available but not yet fast enough and government financial support for private renters is increasing but so are the rents in the private market. Auckland transitional housing provider De Paul House has been thrilled by the response from some Auckland church members who have offered to make houses available for families from the transitional housing to move into long term rentals. This is just one of the ways communities are responding to the housing needs of people in their area. Community housing providers crying out for access to affordable capital funding to help them complete projects that are ready to go as well as continue to plan and prepare further housing projects. The message out of the Maori Housing Conference in November was similar – provide more resources and communities will work with kaupapa Māori housing providers to build housing the works for their whānau, hapu and communities. The lessons learned through the experience of Rauawaawa Kaumatua housing in Hamilton is but one examples of the successes that can be learned from.